Presidential hopeful Newt Gingrich was nipped on the finger by a penguin during a private tour of the St. Louis Zoo last week. TIME takes a look at animals that are troublesome to mankind, including, rats, locusts, baby-eating dingoes ... and pandas. Measuring 3 ft. (1 m) long and weighing up to 100 lb. (45 kg), Asian carp are hardly your average fish. Originally from China, Asian carp are an invasive collection of fish that take over and destroy ecosystems by devouring plankton and disrupting their habitat's existing food chain. They're ravenous (often eating half of their body weight in one day), they reproduce often, and they are difficult to capture. 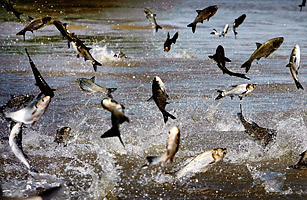 One particular species, the silver carp, can pose an even more immediate threat. Easily startled, they're known to jump into the air and knock out fishermen, causing injuries such as black eyes, broken bones and concussions. In February 2010, the White House even convened an Asian carp summit after the dangerous fish were found closing in on the Great Lakes. Watch TIME's video "Holy Carp! Flying Fish in Illinois."